Advanced Inventory System and Thriving Economy. We have a custom built Advanced Inventory and Item System that is global across our gamemodes. The weapons you obtain have almost endless possible variations(think Borderlands stats-wise). Collect items, Customize your Appearance, hunt for rare loot, trade with players, and open crates. With over 100,000 marketplace transactions to date, our players keep a thriving in-game economy based on the currency "Coins". There's also plenty of ways to earn coins, such as trading, weekly quests, minigames, post-round TTT drops, crates, boss-fights, and tons more. Party-based Events, Raids, and Boss Fights. Fight a range of Bosses or partake in party-based events for loot, each one offering unique rare very-sought after Godlike items! Our Lobby Server acts as a central hub for these..
FRG TTT - not your average TTT experience. Our TTT server is highly optimized, and has Inventory/Loadout Integration. Items you obtain elsewhere will be usable here. We also have a custom written hit-detection system, that pretty much fully eliminates "shitboxes". There's a wide range of custom T/D Items, and It also offers plenty of other minigames, such as "Bouncing Mayhem Rounds", "Orbital Survival Rounds", "Hunter Rounds", "Infection Rounds", "One Clip Chaos", "Gun Game", "Dragon Boss Fight", and "Spider Queen Rounds". All of which can be completed to obtain Loot Drops! Our "Coinshop" system is more than just a way to buy crates and other various items. It also allows you to customize accessories on your player, the way YOU want. You can change which bones they are attached to, move them, scale them. You name it. With well over 100,000 transactions, The FRG Marketplace is the easiest, and most used way to buy and sell your items. Browse on the Forums, or in-game. You can also check your items 'estimated price' to get a general idea of your items worth based on previous marketplace sales. There are many more things on FRG. The features listed are only just a few in our massive, ever-growing feature list. Be sure to check us out! 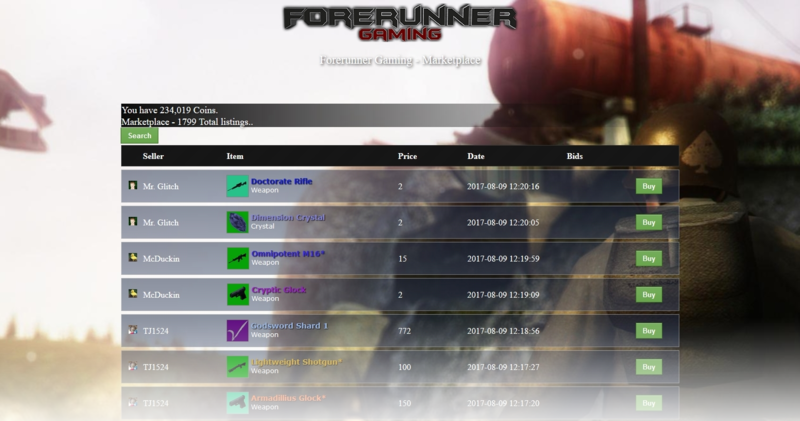 Visit our forums to find details on our hosted servers.